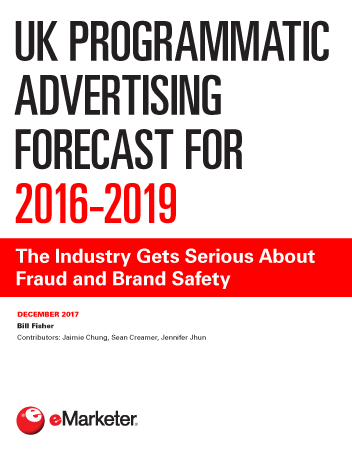 The UK market for programmatic digital display ad spending continues to be strong, despite concerns about brand safety and other issues that made it into mainstream media this year. There are still kinks to iron out, but transparency is improving and will get even better as various technological plays come into effect. Programmatic digital display ad spending continues to rise at a healthy clip. From £1.99 billion ($2.69 billion) in 2015, programmatic will account for £3.39 billion ($4.58 billion) in 2017 and £4.52 billion ($6.10 billion) by 2019. The predominance of social media display spending has skewed the market toward programmatic direct—the majority of social display is bought this way. Real-time bidding (RTB), which includes both open market and private marketplace spending, is expected to account for 45.5% of the programmatic total for 2017, while direct will take up 54.5%. Mobile continues to be a major growth driver of programmatic, while 2017 was projected to be the first year where desktop display saw a decline in programmatic spend. Mobile spend will reach £2.64 billion ($3.56 billion) and account for 78.0% of the total market. Video continues to grow, but quality inventory is limited, so that much of what is available is low quality and often open to fraud. In response to programmatic being in the spotlight like never before (often for the wrong reasons), the industry has begun to step up its game even more with regard to transparency. Initiatives like ads.txt are a step in the right direction toward making the programmatic supply chain easier to manage and scrutinize. "Growth in programmatic digital display ad spending is strong at £3.39 billion ($4.58 billion). This represents 79.0% of all UK digital display ad spending, and that share will reach 84.5% by 2019."